Metal 3D printing systems tend to dominate headlines, especially as more players come into the game (and still more announce their intention to enter). The technology, as industry experts frequently underscore, is hot — at least as a topic, as today not all need high heat. Metals are an undeniable focus and growth factor in additive manufacturing, and took a great deal of attention at last week’s RAPID + TCT. One interesting factor is that as more competitors bring metal capabilities to additive technologies, competition isn’t necessarily directly picking up. The various technologies falling under the umbrella of additive manufacturing each have best-fit application areas. Many developments are focusing on aerospace components and fine-resolution detail prints; Australia-based SPEE3D is looking to broader opportunities in commodity parts. The high-speed metal 3D printing solution is focused on speed, cost, and repeatability and, as company CEO and Co-Founder Byron Kennedy told me when we met at RAPID + TCT last week, isn’t competing with most 3D printing companies. For SPEE3D, the competition is in casting. This traditional area is a prime target for many additive technologies, as 3D printing is set to disrupt sectors of the massive casting market. “At three times the speed of sound, material sticks and creates full-density parts. The benefits are it’s very fast and is low cost. We don’t compete with most 3D printing companies; we make cast aluminum parts, fast, and at a low cost,” Kennedy explained as we looked into the LightSPEE3D machine with its six-axis KUKA robotic arm. The system launched at formnext 2017, introducing its supersonic 3D deposition (SP3D) technology. Business is currently focused about half and half on work with aluminum and copper powders. This latter, Kennedy continued, is a very interesting focus and has driven many inquiries. A wall at the booth showcased 16 copper components that were 3D printed in 11 and a half minutes — for a cost of $6.25. So new is this capability that despite showing videos and being on-site at formnext and other previous events, people still didn’t believe it until they saw the process in action with their own eyes. To that end, the SPEE3D team ran demos throughout RAPID + TCT to show SP3D live. These had a strong turnout and continued to raise inquiries. “We create practical parts. We’re targeting low-cost commodity parts. Our background is in manufacturing,” Kennedy continued. The system is set to make every part of the process more efficient, in terms of not only manufacturing speed and costs, but operation. The user interface was designed to avoid the ‘clunkiness’ of similar systems, and its creators looked to the games industry to create a smoother setup. Working with the gaming department of a university, they developed a “very Netflix-style” menu created for ease of use and essentially touch-and-go operation. Kennedy showed me the process for getting to the files they were using for the on-site demos, and indeed it took just a few swipes of the screen and touches of well-labeled and easily distinguishable graphic options to get everything into place. SPEE3D uses a cloud-based software for its process, with operations including part simulation, code generation, uploading, and ultimately hitting print. All, Kennedy explained, was “designed to be as user-friendly as possible.” The system itself is automated and “very easy,” as a side window in the machine lets the robotic arm put completed parts through to continue on to the next job. Everything about this system was designed for production 3D printing, and it’s been grabbing a good deal of interest as it’s hit the market. “We have shipped and are shipping to Germany, Singapore, the US, and Australia; our focus now is to get more machines onto the market. Some are going into research and new markets that we hadn’t thought of. The focus now is getting them into people’s hands and letting them get into uses we hadn’t thought of because we’re a machine manufacturer,” Kennedy said. 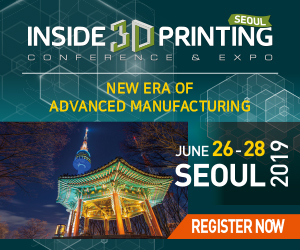 As the LightSPEE3D machines see more installations, SPEE3D is looking ahead. Next steps include scaling up, and Kennedy noted that that includes for the systems themselves: next year the team will introduce new machines, featuring a bigger bed and bigger robots. Discuss metal 3D printing, SPEE3D, casting, and other 3D printing topics at 3DPrintBoard.com or share your thoughts in the Facebook comments below.